Some fish are very clever. With the heron there to stalk. Over the water I lent. Brought my rod I did. They’ll swim away I bet. I’ll think in a minute or two. And went for a plod. Dan’s rod I will borrow. Take his rod I will !!! Then I see a fish. I go bye to that fry!! Looking at the light blue sky. In the style of a dish. As silly as a dish. Stood in the water wishing. Listen to the water dripping. Pupils at Thorneyholme School have written poems with a fishy theme. Sometimes they have ducks sitting straight. Then it said to me goodbye. It sang a lovely tune for me. Then it caught a juicy fly. It is time to go home I thought with a sigh! I am upon the river bank. Then a big bang and crash. It was sat on a river log. That wasn’t on a dish. Looking up at the bright blue sky. Now my child do not frown. Hello I am an alevin. I only have a small fin. My Dad is bigger than me. I am smaller than a flea. Hello I am a little fry. I can hear a boy cry. Now a car whistles by. And I jump up for a fly. Hello I am a parr. Look at that man with the jar. Look at that car over there so far. Oh no I’m in the jar. Hello I am a smolt. Look at that man saying halt. Oh look at that float. Now I’m near a boat. Hello I am an adult trout. On no my son is in that boat. You could swim down to the salt. 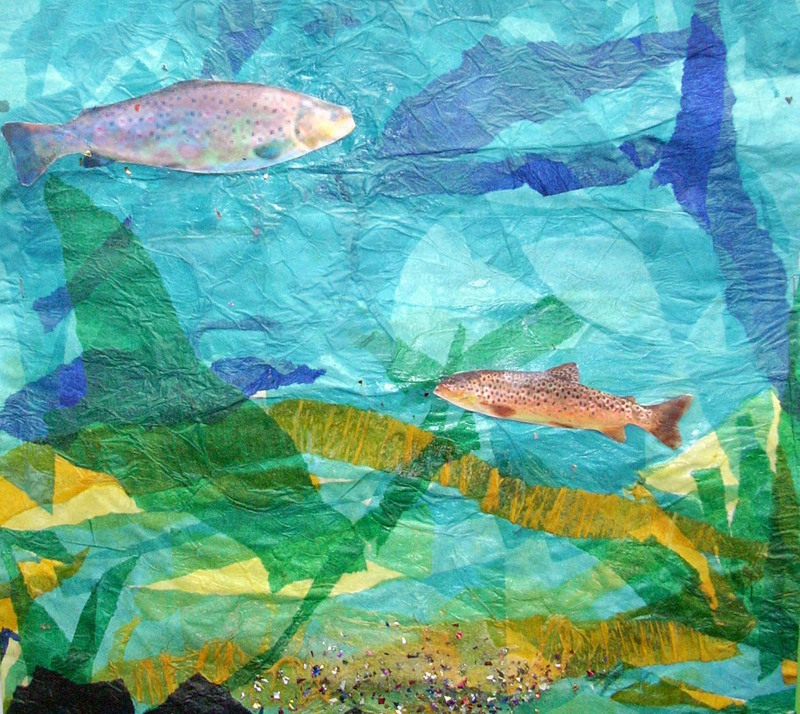 Children at Brabin's Endowed School in Chipping have been studying the life of the trout. They have had fun illustrating its journey to the sea and back in a series of lovely pictures. Click Download brabins_trout_story.pdf to see the completed work.